This is the main form of entertainment. Traditional music sessions both organised and impromptu are held in the pubs on the islands. Classes in all instruments are also available during the winter. Set and Céilí dancing is also done. Sean Nós singing( that is old style solo and unaccompanied) is one of the most ancient form of traditional singing in the western world. It is the most popular form of singing on the islands and is widely performed. The Aran (or Arran) jumper/sweatertakes its name from the Aran Islands, was popular in the fishing villages on and islands off the West Coast of Ireland, or from the Isle of Arran off the west coast of Scotland. They are distinguished by their use of complex textured stitch patterns, several of which are combined in the creation of a single garment. The word choice of ‘jumper’ or ‘sweater’ (or indeed other options such as ‘pullover’ and ‘jersey’)is largely determined by the regional version of English being spoken. In the case of Ireland and Britain ‘jumper’ is the standard word with ‘sweater’ mainly found in tourist shops. To be even more respectful/aware of the local culture the word used in Irish Gaelic is ‘geansaí’ and in Scottish Gaelic ‘geansaidh’ (both pronounced “gahnzee”). Originally the jumpers were knitted using unscoured wool that retained its natural oils or lanolin which made the garments water-resistant and meant they remained wearable even when wet. It was primarily the wives of Island fishermen who knitted the jumpers. Some stitch patterns have a traditional interpretation often of religious significance. The honeycomb is a symbol of the hard-working bee. The cable, an integral part of the fisherman’s daily life, is said to be a wish for safety and good luck when fishing. The diamond is a wish of success wealth and treasure. The basket stitch represents the fisherman’s basket, a hope for a plentiful catch. Traditionally an Aran jumper is made from undyed cream-coloured báinín (pronounced bawneen), a yarn made from sheep’s wool, sometimes “black-sheep” wool. They were originally made with unwashed wool that still contained natural sheep lanolin, making it to an extent water-repellent. Up to the seventies the island women spun their own yarn on spinning wheels. The jumper, locally called a geansaí, usually features 4–6 texture patterns each of which is about 2–4 inches in width, that move down the sweater in columns from top to bottom. Usually the patterns are symmetrical to a centre axis extending down the centre of the front and back panel. The patterns also usually extend down the sleeves as well. The same textured knitting are also used to make socks, hats, vests and even skirts. There is debate about when island residents first started making the jumpers. Some have suggested that the jumper is an ancient design that has been used on the island for hundreds of years. Proponents of this theory often point to a picture in the Book of Kells that appears to depict an ancient “Aran jumper”. Also many megaliths around Europe depict similar patterns as those used in the knitting, which are carved into the stone, and date back several thousand years. However it is more likely that the knitting stitches were modeled on these than that they evolved contemporaneously. Most historians agree that far from being an ancient craft, aran knitting was invented as recently as the early 1900’s by a small group of enterprising island women, with the intention of creating garments not just for their families to wear but which could be sold as a source of income. The first Aran knitting patterns were published in the 1940s by Patons of England after being supplied by Ó Máille’s shop in Galway. Ó Máille’s was also responsible for most of the costuming used the filming of The Quiet Man in 1951. Vogue magazine carried articles on the garment in the 1950s, and jumper exports from the west of Ireland to the United States began in the early 1950s. The development of the export trade during the 1950’s and 1960’s took place after P.A. Ó Síocháin organised an instructor, with the help of an IDA Ireland grant, to go to the islands and teach the knitters how to make garments to standard international sizings. Knitting became an important part of the island’s economy and during the 1960’s, even with all available knitters recruited from the three islands he had difficulty in fulfilling orders from around the world. Aran jumpers are sometimes sold as a “fisherman sweater”, indicating that the jumper was traditionally used by the islands’ famous fishermen. It is said that each fisherman (or their family) had a jumper with a unique design, so that if he drowned and was found maybe weeks later on the beach, his body could be identified. There is no record of any such event ever taking place. This misconception may have originated with J.M. Synge’s 1904 play ‘Riders to the Sea’, in which the body of a dead fisherman is identified by the hand-knitted stitches on one of his garments. However, even in the play there is no reference to any decorative or Aran type pattern. The garment referred to is a plain stocking and it is identified by the number of stitches, the quote being “it’s the second one of the third pair I knitted, and I put up three score stitches, and I dropped four of them”. There is also some doubt about whether Aran jumpers were ever widely used by fishermen and many argue that the original jumpers with their untreated yarn would not have been suitable for this use. They were quite thick and stiff, which would probably restrict the movements of a fisherman. On the other hand these garments were the only form of hardy clothing they had to weather the Atlantic Ocean storms in. Islanders can be seen wearing them in photographs taken early in the last century. Arising from the myth above is a widely believed misconception that Aran patterns have clan associations, somewhat like Scottish tartan. Although sometimes used as a marketing device, there is no evidence for any such association even among families who lived on the Islands. Only a relatively small number of family names are or were ever found on the Aran Islands and the majority of Irish families have no history of either wearing or knitting jumpers of any particular pattern. While in the past the majority of jumpers and other Aran garments were knit by hand, today the majority of items on sale in Ireland and elsewhere are either machine knit or produced on a hand loom. There are very few people still knitting jumpers by hand on a commercial basis. Machine knit jumpers tend to use finer wool and have less complex patterns, since many of the traditional stitches cannot be reproduced this way. They are the least expensive option. Hand looming allows more complicated stitches to be used, will have more stitches to the inch and be thicker. The best quality hand loomed sweaters are almost indistinguishable from hand knit. Hand knit jumpers tend to be more tightly knit, to have more complex stitch patterns and to be longer lasting and they attract a significant price premium. By holding them up to light the difference between the machine knit and hand kits is self-evident. In this blend of documentary and fictional narrative from pioneering filmmaker Robert Flaherty, the everyday trials of life on Ireland’s unforgiving Aran Islands are captured with attention to naturalistic beauty and historical detail. The islands are renowned for their writers. One of Ireland’s foremost Irish language poets of the 20th century Máirtín Ó Direáin was born and raised in the village of Sruthán on Inis Mór. Liam O Flaherty the world renowned bi-lingual novelist and short story writer was from the village of Gort na gCapall in Inis Mór. The present day modern Irish writer Darach Ó Chonghaile was born on Inis Meáin and now lives in Inis Oírr. Beginning around the late 19th Century, many Irish writers travelled to the Aran Islands; Lady Gregory, for example, came to Aran in the late nineteenth century to learn Irish. Many wrote down their experiences in a personal vein, alternately casting them as narratives about finding, or failing to find, some essential aspect of Irish culture that had been lost to the more urban regions of Ireland. A second, related kind of visitor were those who attempted to collect and cataloge the stories and folklore of the island, treating it as a kind of societal “time capsule” of an earlier stage of Irish culture. Visitors of this kind differed in their desires to integrate with the island culture, and most were content to be considered observers. The culmination of this mode of interacting with the island might well be Robert J. Flaherty’s 1934 classic documentary Man of Aran. Isolated from mainstream print and electronic media, and thus reliant primarily on local oral tradition for both entertainment and news. Rarely visited or understood by outsiders. Strongly influenced in its traditions and attitudes by the unusually savage weather of Galway Bay. In many parts characterized by subsistence, or near-subsistence, farming and fishing. Adapted to the absence of luxuries that many parts of the Western world had enjoyed for decades and in some cases, centuries. Instead, they looked directly towards ways in which their time on the islands put them in touch with more general truths about life and human relations, and they often took pains to live “as an islander,” eschewing help from friends and family at home. Indeed, because of the difficult conditions they found — dangerous weather, scarce food — they sometimes had little time to investigate the culture in the more detached manner of earlier visitors. Their writings are often of a much more personal nature, being concerned with understanding the author’s self as much as the culture around him. This third mode of being in Aran died out in the late 1970s due in part to the increased tourist traffic and in part to technological improvements made to the island, that relegated the above aspects to history. Perhaps the best literary product of this third kind of visitor is An Aran Keening, by Andrew McNeillie, who spent a year on Aran in 1968. Another, Pádraig Ó Síocháin, a Dublin author and lawyer, learning to speak Gaelic to the fluency of an islander became inextricably linked to the Aran handknitters and their Aran Sweaters, extensively promoting their popularity and sale around the world for nearly forty years. A fourth kind of visitor to the islands, still prominent today, comes for spiritual reasons often connected to an appreciation for Celtic Christianity or more modern New Age beliefs, the former of which finds sites and landscapes of importance on the islands. Finally, there are many thousands of visitors who come for broadly touristic reasons: to see the ruins, hear Irish spoken (and Irish music played) in the few pubs on the island, and to experience the often awe-inspiring geology of cliffs. Tourists today far outnumber visitors of the four kinds discussed above. Tourists and visitors of the fourth kind, however, are under-represented as creators of literature or art directly connected to the island; there are few ordinary “travelogues” of note, perhaps because of the small size of the islands, and there are no personal accounts written about Aran that are primarily concerned with spirituality. Tim Robinson’s Stones of Aran: LabyrinthStones of Aran: Pilgrimage (1989), and his accompanying detailed map of the islands is another resource on the Aran Islands. It is an exhaustive, but not exhausting, survey of the Aran geography and its influence on Aran culture from the iron age up to recent times. The first peoples populated the islands around 3,000BC. Where they came from we are not sure but they are likely to have come in from the mainland of Ireland. These first people built in stone. Stone-age or Megalithic monuments can be found on the three islands. A wedge tomb dating from 2,500BC such as that found at Corrúch in Inis Mór is a typical example. The second main phase of occupation on the islands is what is referred to as the Bronze Age civilisation. This dates from about 1500 BC to 500BC. It so called because of the bronze objects made by these people. Cnoc Raithní in Inis Oírr is an example of a bronze age burial mound in which various bronze objects were found( cf. Monuments of Inis Oírr). Bronze age objects were also found at Dún Aonghasa one of the great stone forts of the islands. The Bronze Age was followed by the Iron Age and the arrival of the Celts. The Iron Age is so called because the people used Iron. The Celts were especially famous in Europe for their smithcraft. Some of the forts are also thought to be iron age. The Irish word Dún means fort and the islands are famous for their stone forts. These are thought to date from the late Bronze age( 1100BC) through to the Iron age (300BC-500AD). There are a number of forts found on the three islands. They are part of a complex of such structures found along the west coast of Ireland from Donegal in the north to Kerry in the south. 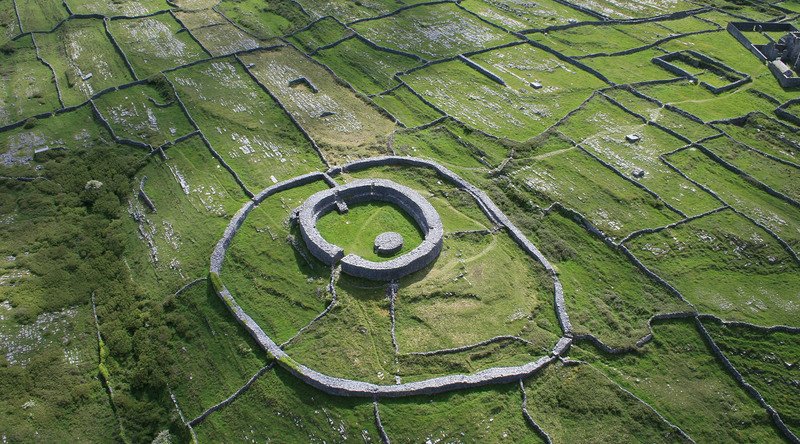 Over the past decade a number of these forts including Dún Aonghasa on Inis Mór have been excavated as part of ‘ The Western Stone Forts Project’. What the function of these forts was is unclear. Some suggest as well as being habitation sites they may also have been used for ritual purposes. The chief source of livelihood on the islands is fishing, tourism and farming. Fishing includes both on-shore and off-shore from small boat and deep sea trawler. The traditional Curach boat is still used by some on the islands (cf. Picture). Mackeral, Pollock, Rock fish and many other fish types as well as shellfish, seals and dolphins are all part of the aquatic life of the islands. There is a seal colony on the shore at Corrúch village, Inis Mór. ( Photo) The visitor can enjoy a day’s angling on-shore and off -shore.